Yoga is an ancient practice and a way of life that originated in India, and includes the practice of postures, regulated breathing and meditation . It is a mode of activity found to have multiple benefits for older adults [9–11]. 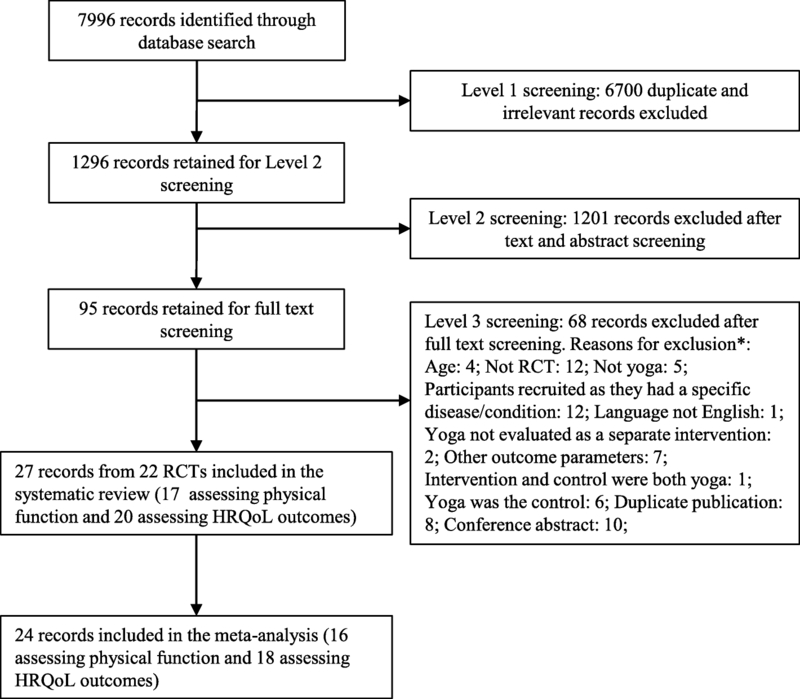 Previous systematic reviews have provided evidence on the beneficial effects of yoga in older adults in terms of promoting cardiovascular health , balance and mobility , alleviating depression and improving quality of sleep . A recent systematic review and meta-analysis by Tulloch et al. 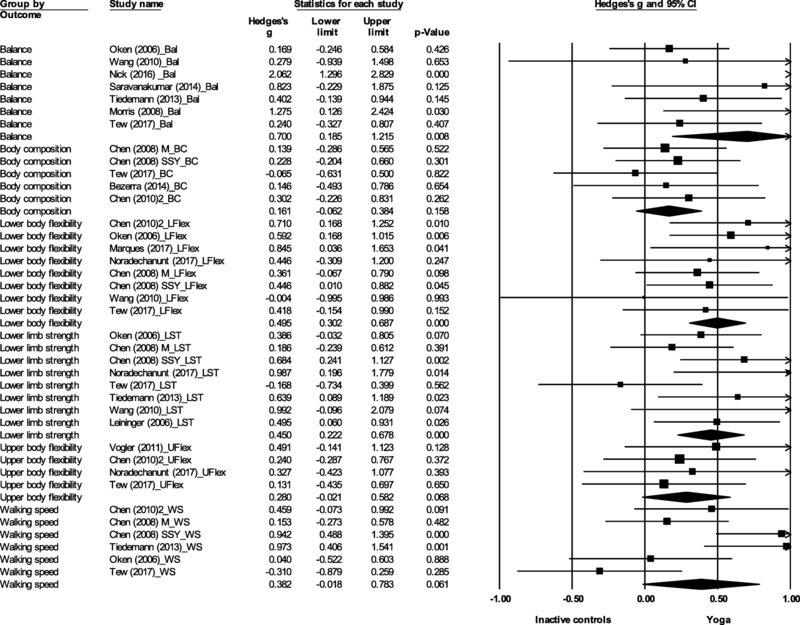 found that yoga had a medium effect on health related quality of life (HRQoL), and a small effect on mental wellbeing in people aged 60+ years. In this review, HRQoL was measured by physical component summary scales, and mental wellbeing was assessed by mental component summary scales from questionnaires like SF-36 and WHOQOL. However, HRQoL has been described as a concept encompassing several aspects of overall quality of life that can be clearly shown to affect health , including anxiety, stress, depression, vitality, social health and sleep , which were not assessed in the review. Studies with yoga as a control group were excluded from the review (n = 6) [32–37]. In these studies, the yoga group was used to control for aspects such as social stimulation and attention from trainers, without producing an aerobic response. The reporting for the controls was not rigorous, and the yoga programmes were not described in detail. Some studies dated back to 1989, making it difficult to procure the necessary data for them. A custom data extraction form for descriptive characteristics (Additional file 2) was developed and piloted by three researchers (DiS, GB, CF). Descriptive data were extracted for all included studies by one researcher (DiS), and 33% of these were cross-checked by another researcher (GB or KL). Outcome data were extracted by one researcher (DiS), and 100% cross-checked by another researcher (KL). Discrepancies were resolved through discussions among the researchers (DiS, KL). Authors of studies for which outcome data were not available were contacted and requested to provide the data, and were asked for clarifications if required. One study only reported median, minimum and maximum values for outcome variables . 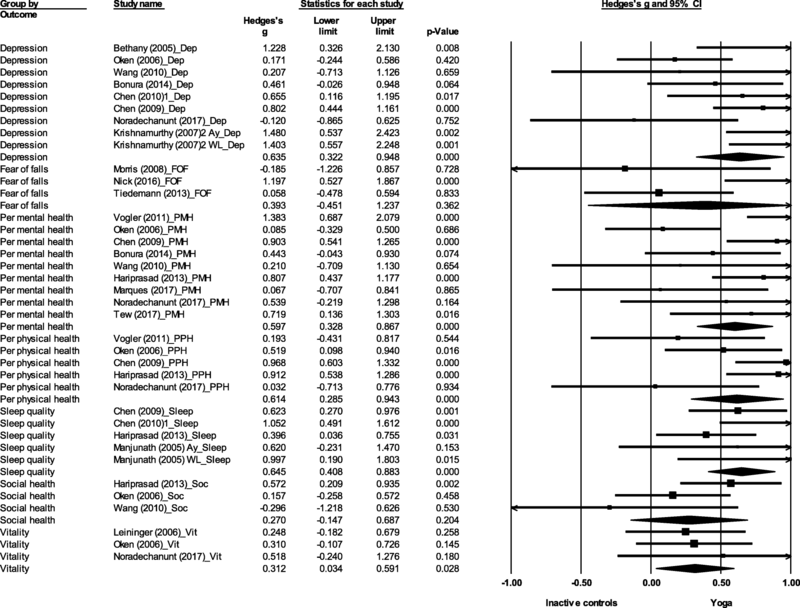 Means and standard deviation were imputed from these data [40–42], and the study was included in the meta-analysis. Risk of bias was assessed independently by two researchers (DiS, KL) using the Cochrane risk of bias tool . The following domains were assessed for physical function and HRQoL outcomes separately: selection bias (random sequence generation, allocation concealment), detection bias (blinding of outcome assessment), attrition bias (incomplete outcome data), reporting bias (selective reporting), and other bias (sample selection bias [44–47], contamination bias [45, 46], compliance bias  and response bias ). Performance bias (blinding of participants and personnel) was not assessed as it is impossible to blind participants and personnel in a yoga intervention study. 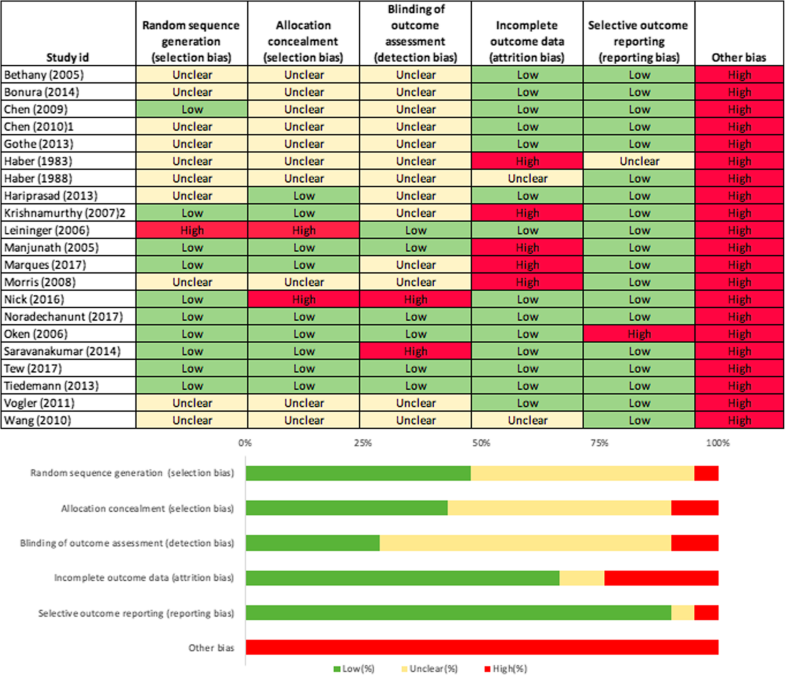 Under each domain, studies were classified as low, high or unclear risk of bias. Discrepancies were resolved through discussion between the two researchers. 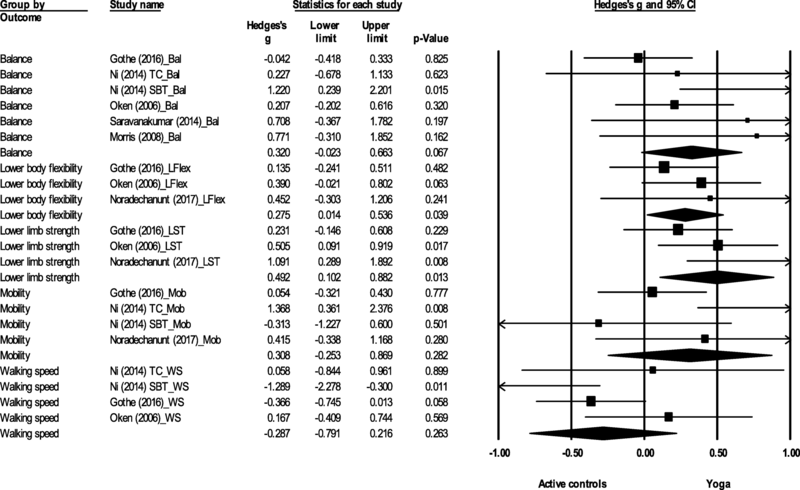 One study had two yoga intervention groups and one control group . 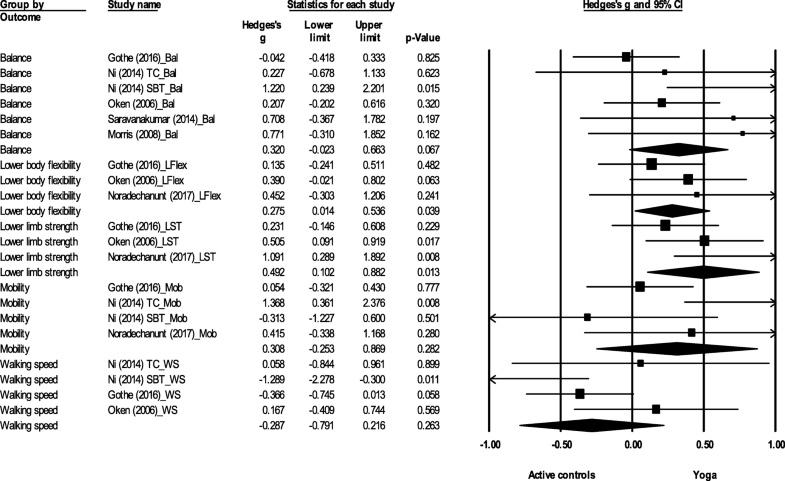 Both yoga groups were included in the meta-analysis, each one compared with half the number of participants in the control group . Four studies [55–58] had one yoga intervention group and two control groups. In these cases the result was included twice in the meta-analysis with half the number of participants for the yoga group each time . Following this, two sensitivity analyses were also conducted: (i) comparing the full yoga intervention arm and the first control group, and (ii) comparing the full yoga intervention arm and the second control group. Five included studies [53, 57, 59–61] used cluster randomisation, and an iteration of the meta-analysis was run after adjusting the number of participants in the studies to account for this (adjusted sample size = original sample size /design effect, where design effect = 1+ (Average cluster size - 1)*Intracluster Correlation Coefficient; calculations presented in Additional file 3) . 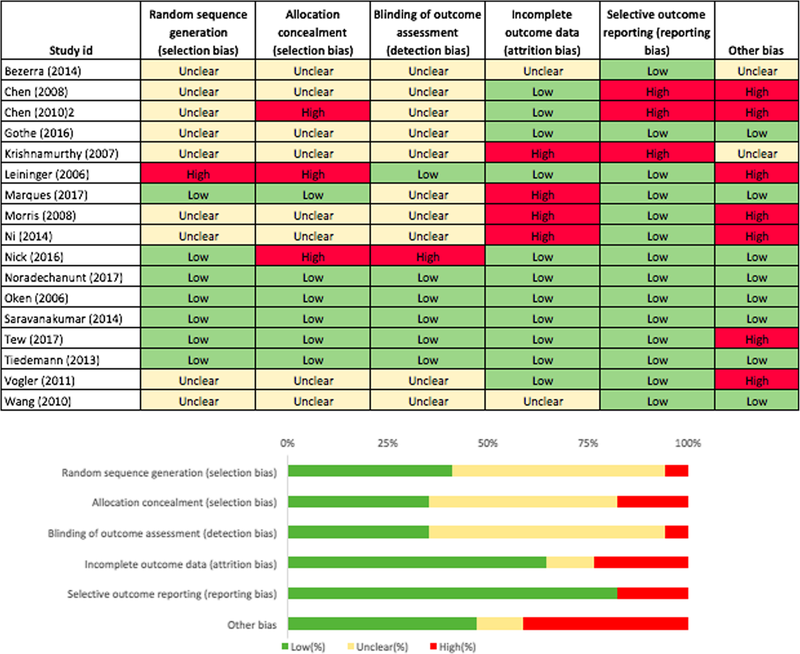 Four studies [53, 59–61] had the requisite data for cluster randomisation adjustment, and one study  was removed from this analysis due to lack of data. There were insufficient studies (less than 10) in the meta-analyses to test for publication bias using funnel plots . Ten studies were from the USA [55, 56, 63–70], four from Australia [39, 71–73], two from Taiwan [53, 59], two from India [57, 74], and one each from Brazil , Iran , UK  and Portugal . The number of participants in studies ranged from 18 to 410, and the mean size was 77 ± 84. Eight types of yoga (Table 3) were used in the studies including Hatha yoga (4 studies) [67–69, 76], chair yoga (3 studies) [55, 63, 78], Iyengar yoga (3 studies) [39, 64, 73], Silver Yoga (2 studies) [53, 59], The Easy Does It Yoga Programme (2 studies) [66, 70], balance yoga programme , Thai Yoga  and the British Wheel of Yoga (BWY) Gentle Years Yoga programme . Five studies did not mention the type of yoga programme conducted [57, 65, 71, 74, 75]. The most common class structure for the yoga intervention adopted by included studies was a warm up, followed by the main postures, and ending with relaxation, breathing and meditation. Some common postures (used in four or more included studies) are: Cat and cow pose, Tree position, Triangle position, Seated twists, Mountain pose, Warrior 1, Cobra, Chair pose, Eagle or Half eagle, Locust posture, Downward dog, Wind relieving pose, Child’s pose, Standing hands on feet pose, Cow face pose, and Corpse pose (used for relaxation). The length of interventions ranged from four to 28 weeks, the most predominant being 24 weeks (6 studies) [53, 57, 59, 63, 64, 74] followed by 12 weeks (5 studies) [56, 72, 73, 75, 77], and eight weeks (4 studies) [39, 67, 68, 76]. The most common frequency of intervention was two sessions per week (9 studies) [39, 56, 65, 67, 69, 71–73, 76], followed by three sessions per week (6 studies) [53, 55, 59, 66, 68, 75]. Eight studies also encouraged practicing yoga at home in addition to class based sessions [39, 64, 69, 70, 72–74, 77]. Duration of classes ranged from 30 min to 90 min. A 60 min class duration was reported most frequently (9 studies) [56, 57, 65–67, 69, 73, 74, 76]. One study did not report class duration . Inactive controls used in the studies were wait-list control (8 studies) [39, 53, 57, 59, 63, 64, 74, 77], playing games like Dominoes, Chinese Checkers and Scrabble , fall risk awareness , socialisation , education on osteoporosis and fitness , fall prevention education booklet , herbal preparation , telephone counselling , film series or art class , and usual care where no intervention was provided but participants could continue to use the facilities provided by the residential care centre like bingo, story-telling, exercise classes and gym . Active controls included were Tai Chi (3 studies) [56, 71, 72], chair aerobics/exercise (2 studies) [55, 63], a walking programme (2 studies) [55, 64], balance training (2 studies) [56, 67], and stretching–strengthening exercises . Yoga is a recognised and accepted form of activity in India where it originated. In western countries, although an increasing trend in older adult participation in yoga/pilates has been observed [86–88], yoga participation rates still remain low [87, 89, 90]. This review adds to the growing evidence on the benefits of yoga, and researchers should work closely with yoga teachers, studios, fitness centres and policy makers to develop and implement strategies to encourage yoga participation among older adults, tying in with the final aim of increasing participation in muscle strength and balance activities.